Argentina Lithium Identifies Drill | Argentina Lithium & Energy Corp.
Vancouver, BC / Marketwired / May 3, 2017 / Argentina Lithium & Energy Corp. (TSX-V: LIT, FSE: OAY1 (WKN: A0RK7E), OTC: PNXLF), “Argentina Lithium” or the “Company”) is pleased to report that its first exploration program has successfully identified drill targets at the 20,500 hectare Arizaro Lithium Project (“the Project”) on the Arizaro Salar in Salta Province, Argentina. The Vertical Electric Sounding (VES) geophysical survey has identified conductive and semi-conductive zones interpreted as geologic units at depth that are saturated with high-density, and potentially lithium-bearing, brines. Of particular interest are conductive zones which thicken to the north and west towards the centre of the salar where the geophysics suggests a sub-basin is located that that may host potentially lithium-bearing brines separate from shallow or at-surface brines.Based on the results of the VES survey, 3-4 initial drill holes reaching depths of up to 400 metres below surface are being planned. The geological environment at Arizaro includes volcanic rock outcrops (ignimbrites, dacites, rhyolites and basalt) and structural conditions similar to other salars in the Puna region where lithium and potash are found.In addition, the large size of the Arizaro basin makes it is possible to find geological and hydrogeological conditions for establishing sub-basins of independent evolution within the salar.These factors support exploration for deep layers of lithium-rich brine which are not directly linked to the surface fluids at the Arizaro salar. 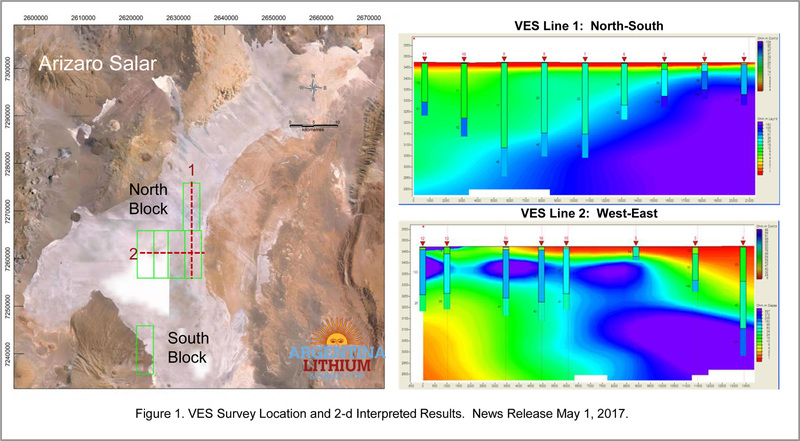 This initial exploration program at Arizaro was, therefore, designed to acquire initial hydrogeological understanding of this largely un-tested salar and to identify conductive zones at depth that may host lithium-bearing brines.The Vertical Electric Sounding (“VES”) program was conducted by Conhidro SRL (“Conhidro”), an experienced local independent contractor.The VES method uses resistivity to characterize the hydrogeological conditions of the salar, including conductive and semi-conductive zones interpreted to be clastic and/or fractured evaporitic sedimentary layers that may contain brines bearing lithium and potash.VES is effective to depths of approximately 400-500 metres below which alternative surveys such as Controlled Source Audio-frequency Magneto-tellurics (CSAMT) are required. Twenty-six stations were selected throughout the 20,500 hectare property, eighteen along north-south and east-west lines in the North Block, located in the central salar, and the remaining eight in the South Block at the southern salar margin.At most of the survey stations trenches were dug up to three metres depth to characterize the surficial lithological layers and to establish the existence, and level, of the water table.Near-surface fluid samples collected from the trenches returned low lithium (<10 mg/l) and potash (<1,500 mg/l) levels. The very large size of the salar and its geomorphology support the potential for discovery of deep brine layers with potential to host higher concentrations of lithium, as well as potash. The VES survey of the North Block of claims (stations 1 – 17 and 26) identified conductive to semi-conductive zones in the which thicken to the north and west towards the centre of the salar.Modelling of 1D survey data into 2D profiles was completed along north-south and east-west section lines (see Figure 1). At the southern block of claims the density of the survey points (stations 18 to 25) is considered insufficient to develop a 2D profile. Conhidro has concluded that the VES results, as well as the geologic and geomorphologic setting, climatic conditions, and hydrogeological environment at Arizaro, when compared to other well-studied salars, including Hombre Muerto, Rincón, Antofalla, Llullaillaco, and Rio Grande, indicate that there is a high probability to find brines at depth with high densities of 1,210 to 1,225 g/l and conductivities higher than 200 microS/cm.The VES results successfully identified clear targets for an initial drill campaign.Three to four holes up to 400 metres in depth are planned to test these targets. To date, the geophysical results have not defined the basement of the salar. The VES was carried out using a Schlumberger four-pole electrode device of geometric constant K = π. ((AM.AN) / MN). The lengths between the electrodes of current (AB) were variable, up to a maximum distance of 1,600 metres. The separations between the potential electrodes (MN) varied between 1 and 200 meters. The Company has the option to earn a 100% interest in the Arizaro Lithium Brine Project, including 20,500 hectares in the central core of the Arizaro Salar, the largest in Argentina and third largest in the “Lithium Triangle”. Very little historic exploration work has been done on the Arizaro Salar, however the central area is interpreted to have the geologic conditions to be the most prospective for quality brine resources.Furthermore, the Arizaro Salar benefits from a strategic location for infrastructure, including: a railway that connects to the deep water port of Antofagasta, nearby advanced mining projects that are expected to bring significant development of access routes and power, and the availability of water for development.For additional information on the Project please see the Company website www.argentinalithium.com .